For reasons still unknown to me, I decided it would be a good idea to contact the guys at Funcom so I could review their first console game in ages, with the release of The Park onto the Xbox One. I'm one of those gamers that will jump at absolutely anything. Even while reviewing this game I made myself look a total idiot in front of the other half and jumping out of my pants and shouting many a swear word at a stationary bloody plant. Games like this just put me on edge, a place I hate to be, but also a place I like to test myself on every now and then. 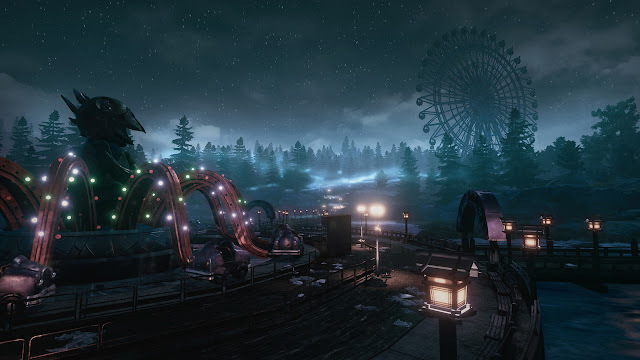 The Park comes out today for the Xbox One (as long as I've got this typed up in time and today is May 3rd) and will cost you £9.99 from what I was told when getting my review code come through last week. Not reading anything up about the game other than facts for the news post I did about the release not so long ago, I went in playing the game not knowing that much, other than expecting a few jumps and no combat with the game being a story driven experience. 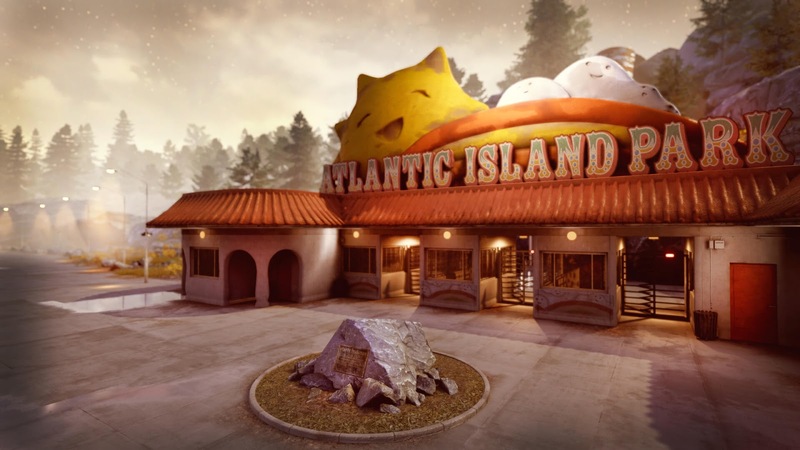 You play a Mother by the name of Lorraine, who with her son Callum have visited the Atlantic Island amusement Park, which looks to be a lovely place to visit say in the shining light and safety of the daytime. Callum though is a bloody idiot, and he only goes and loses his flaming teddy bear. While Mum goes off asking the guy at the ticket office if he has seen it Callum goes and tops the stupidity of losing the teddy in the first place and runs off into to the now closed amusement park to go find it. The ticket guy then lets Lorraine go and chase this little git down to give him a right good telling off, but before you know it things get weird, really weird. As you would expect walking through an amusement part at night all alone turns out not to be that much fun. While you do get to go such rides as the tunnel of love, a ferris wheel, and also a roller coaster, you are also being told a pretty deep and very dark story by this poor Mother who seems to be losing her mind. Sadly in my case I was too busy awaiting the next time something would make me crap my pants or shouting "for fu** sake" at a simple shadow or in my case a plant to take any real deep interest in her issues. Now while the story is told decent enough as you go through the park and look around, I got a sense coming out at the end not really being able to digest what just took place. I got a feeling that it was all wrapped up rather suddenly too, and not really given the long explained ending that story driven experiences need to fully tie it all up into a nice little package. I came out not going "ohhhhhhh" but more "ehhhhh" as the final cut-scene played out, leaving me thinking for a good hour or two afterwards if I had missed something in the notes scattered throughout the park, which for me at least were a struggle to read on my 40 inch TV from about 10 foot away. While the game has a neat idea with it taking place in a theme park, I was expecting a ton of jump scares from this game having not read and reviews on it's previous Steam release, nor did I watch any videos before playing it. 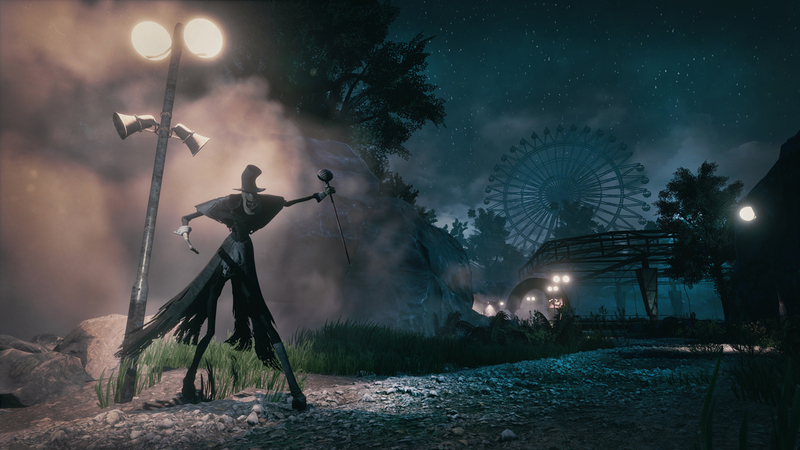 Sadly I can count on one hand how many times The park made me jump and drop an f-bomb at the TV, with only really two scares happening throughout the whole game for me. The rest of them rather than being the fault of the game were all down to my all mind playing tricks on me. I've already talked about jumping at a plant coming out the floor for no reason at all, but I guess the sound in the game can also claim part of that jump scare too. Without spoiling the game for you (please skip to the next section of the review if you still want to know nothing about the game for yourself), I was sad to see a P.T Demo style section taking place at one point in the game, as once you've seen one game use the go through door after door section while changing how it looks, you kind of know what's coming next. Onto the final thing I need to bring up in this review, that being price and how long the game will take you to finish. The Park will take you anywhere between an hour to 2 hours to finish, with myself taking just under the 2 hour mark before typing this up. With the game costing £9.99 this will put many console owners off instantly, as while the playthrough was an alright experience to an extent for me, asking me if I would be happy to have paid £9.99 for something which only lasted two hours and is very much a one off experience would be something else. 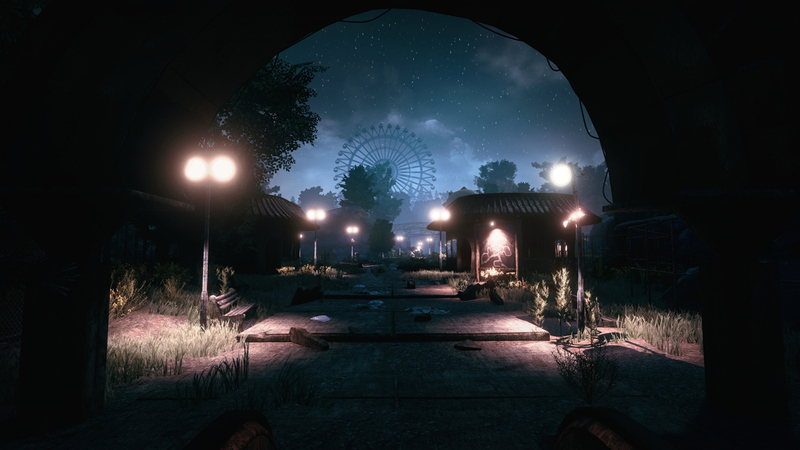 Overall: The park while a unique experience to gamers like me who rarely dip into something that plays on what the mind pictures rather than what is actually there in front of you, still throws up the same things we've seen numerous times before. If you love games like this though, The Park ticks all the right boxes, all be it with a somewhat confusing conclusion at the end. Headphones, being alone, and darkness are of course going to make it a much better experience.